The echoes of both Bear and Lehman are growing louder with every passing day. Just hours after Deutsche Bank stock crashed by 10% to levels not seen since the financial crisis, the German behemoth with over $50 trillion in gross notional derivative found itself in the very deja vuish, not to mention unpleasant, situation of having to defend its liquidity and specifically assuring investors that it has enough cash (about €1 billion in 2016 payment capacity), to pay the €350 million in maturing Tier 1 coupons due in April, which among many other reasons have seen billions in value wiped out from both DB’s stock price and its contingent convertible bonds which are looking increasingly more like equity with every passing day. DB did not stop there, but also laid out that for 2017 it was about €4.3BN in payment capacity, however before the impact of 2016 results, which if recent record loss history is any indication, will severely reduce the full cash capacity of the German bank. 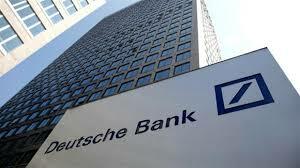 Frankfurt am Main, 8 February 2016 – Today Deutsche Bank published updated information related to its 2016 and 2017 payment capacity for Additional Tier 1 (AT1) coupons based on preliminary and unaudited figures. As a reminder, the last time serious “developed market” banks had to publicly defend their liquidity, the result was a multi-trillion taxpayer bailout. However, there is probably some time before that happens: first German regulator Bafin will likely ban short selling in Deutsche Bank shares. That always is the first step in the endgame. For now, however, the market is no longer asking questions but merely selling: Deutsche CDS has entered the dreaded “viagra” formation at 245 bps and going vertical.